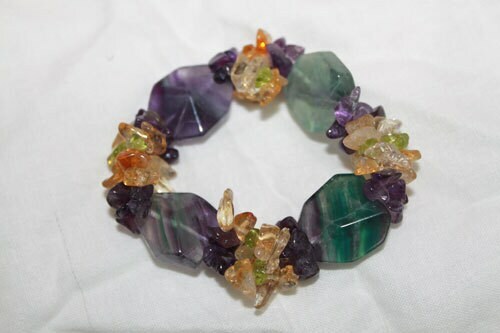 Rainbow Fluorite Crystal stretch bracelet fits most wrists! The gemstones exhibit visible banding, and colors range from greens to purples. Beaded with care and handmade with strong elastic stretch cord. An amazing addition to any jewelry collection, perfect for any occasion. Fluorite comes in a rainbow of colors and is often banded and blended, with phantoms, rainbows, foils and a wide variety of crystal formations! Fluorite is wonderful to use for mental clarity, to increase life force to your brain, and balancing the hemispheres of your brain. It increases your ability to concentrate, balancing the positive and negative relationships of your mind. It helps you to see both reality and the truth behind illusion. 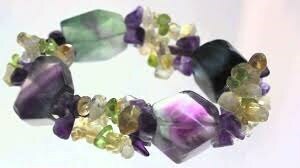 Fluorite is great for protection against disease and healing disease. Peridot- It is known as a stone for prosperity and happiness. Wearing Peridot gemstones will increase your self esteem, and aid you to let go of guilt. Amethyst: Helps you focus on money matters, magnifies the energies of other crystals. Amethyst is good for mental balance, business success, and moving forward in life. This crystal can also assist in releasing tendencies of any form of addiction. Citrine - The stone of Abundance. Citrine is very versatile and is used for mental and emotional clarity, problem solving, memory issues, will power, optimism, confidence and self-discipline. It reduces anxiety, fear and depression. This is the most beautiful bracelet and is highly charged!!! Love It!!! I received this bracelet sooner than I thought I would. It's gorgeous! I like that the stones seem to stay cool.